WASHINGTON, DC -- At a summer camp north of Moscow attended by youth vetted and groomed by Kremlin-sponsored organizations, Russian President Vladimir Putin was warmly welcomed when he visited recently, taking questions from campers, including one about Kazakhstan. Russian President Vladimir Putin (R) and Kazakh President Nursultan Nazarbayev. After complimenting longtime leader Nursultan Nazarbayev, Putin then insulted him, dismissing the history of Central Asia’s largest country. “He created a state in a territory that had never had a state before,” Putin said during the Aug. 29 visit, according to a Kremlin transcript. The comment touched a major nerve in Kazakhstan, where Russian actions in Ukraine are being watched with fear and where ethnic Russians make up nearly one-quarter of the population. It came also as Nazarbayev himself signaled doubts about a Kremlin-led project called the Eurasian Economic Union, a project whose rejection by Ukraine set in motion the events that have led to war. That all former Soviet republics have been spooked by Russia’s actions in Ukraine is without question. The bigger question is how much those actions have changed Moscow’s relationships with those countries, and whether the United States benefits from it, analysts said. “Crimea was our 9/11,” Mankoff said he was told during his trip. “If there’s one country that’s worried about redrawing borders, it’s Kazakhstan,” he said. In Kazakhstan, a sprawling nation that shares borders with China and Russia and is nearly twice the size of Alaska, Nazarbayev has reigned since before the Soviet collapse, and consistently walked a fine line with Moscow. He’s been involved in negotiations to end the fighting in Ukraine, traveling to the Belarusian capital Minsk on Aug. 26 to meet with Putin, Ukrainian President Petro Poroshenko, and Belarussian leader Alexander Lukashenko. On the eve of his trip, though, Nazarbayev told a Kazakh TV channel that Kazakhstan’s membership in the Economic Union was not set in stone. “If the rules spelled out in the agreement aren’t followed, Kazakhstan has the full right to refuse membership in the Eurasian union,” he said. 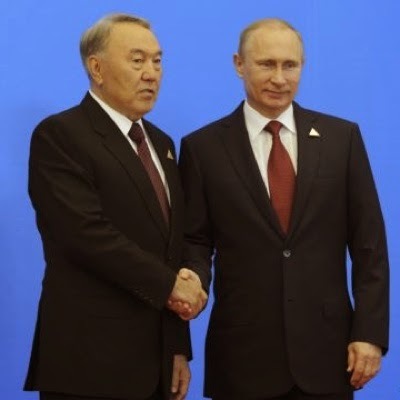 Nazarbayev’s comments “were probably more of a reassurance to Kazakhs rather than a thumbing their nose at Putin,” said Martha Brill Olcott, a longtime Central Asia scholar with close ties to many elites in the region. At the youth camp near the town of Seliger, three days later, Putin gave what appeared to a retort that, to many Kazakhs and academics, trivialized and misconstrued Kazakh history. In the days that followed, Kazakhs lit up Internet chat rooms, online media and Twitter feeds. Videos uploaded to YouTube showed Kazakhs abrading drivers in Kazakhstan’s largest city Almaty for having Russian flags on the cars’ dashboards. Nargis Kassenova, who heads the Central Asian Studies Center at KIMEP University in Almaty, said a number of Kazakh experts think Putin’s comments were a direct response to Nazarbayev’s interview. “The comments and especially the one on lack of statehood raised even more suspicions of Russian intentions since it was the discourse on lack of proper statehood in Ukraine that accompanied Russian actions there,” she said in an email interview. Calls and emails to the Kazakh Embassy in Washington seeking further comment were not immediately returned. “One, he’s trying to get Nazarbayev’s goat and two, any Russian living in Kazakhstan would agree with him. Kazakhstan has one of the largest populations of ethnic Russians living outside of Russia: just under 25 percent, according to the 2009 census. In some northern regions bordering Russia, however, ethnic Russians make up close to half of residents, outnumbering even Kazakhs. Bilateral trade is among the largest for post-Soviet republics, and Kazakh oil and gas extraction is growing substantially, particularly in the multinational-run Caspian Sea fields where Chevron has major investments. Lacking access to international maritime routes, Kazakhstan is overwhelmingly dependent on Russia pipelines for export. “Kazakhstan never wanted to be exclusively partnering with Russia. Now, they’re changing borders. Why can’t they change the rules of this organization,” Cooley said. For the United States, Central Asia holds less importance than it did during the war in Afghanistan when U.S. military personnel and equipment transited the region. That’s changed with the wind-down in Afghanistan. Still, where Washington is concerned, keeping Kazakhstan from being stuck under Moscow’s thumb is beneficial. “Anything that projects Kazakhstan in the international arena, rather than strictly a post-Soviet space, would be useful to the US interests,” Cooley said.